Totally out of the blue I received an invite for an invent at a local micro-winery in San Juan de Lurigancho, a district outside of Lima Peru. I wasn’t even aware of Bodega y Viñedos Candela, and certainly had never tried any of their wines, but suddenly I was in the middle of their annual pisa uva festival, which marks the completion of the harvest and start of the winemaking work itself: specifically, the traditional crushing of the grapes by foot. “Pisa uva” means, literally, stepping on grapes. 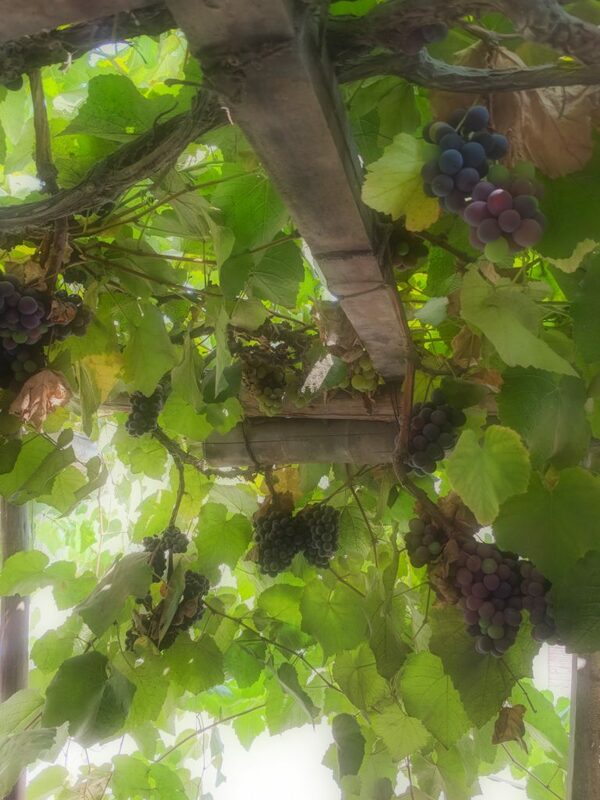 The Bodega is simply someone’s three-story home, with grapes grown on terraces shoved on the roof. The grape here is Borgoña, a table wine grape reportedly part of the Isabella family, which is rare in most parts of the world but which comprises the main ingredient in most of the domestic wines produced in Peru. Candela uses two strains, the “Borgona Negra” for its vino tinto, and “Borgona Blanco” for the vino blanco. I tasted both off the fine, and they were surprisingly edible, although definitely wine grapes, and — I’d find out later — the resulting wine carried over much of the original fruit flavors. Dancers perform an African-inspired dance that is traditional to Peru. 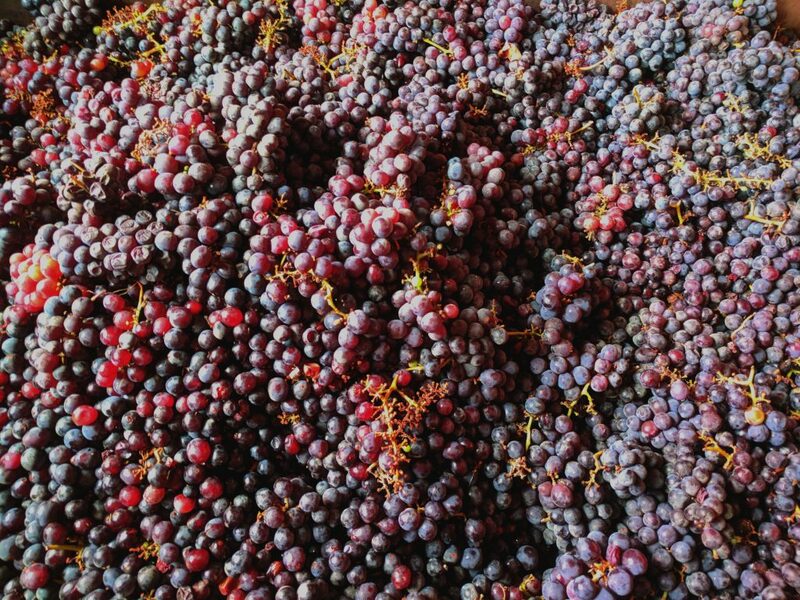 The grapes are also used for Candela’s other main product, pisco. This is a clear, fermented grape liquor, similar to grappa, that shoulders the pride of the entire nation of Peru. There are few things Peruvians are more proud of, other than pisco and its incredible ceviche, both of which neighboring Chile claims to have originated (but they totally didn’t.) Peruvian pisco is astonishingly strong, and is not taken straight, but instead in the famous pisco sour, a cocktail made of pisco, lime juice, gum arabic, egg white and bitters. It’s remarkably good — fantastic even — although you can’t drink much of the stuff if you want to maintain a respectable relationship with gravity. 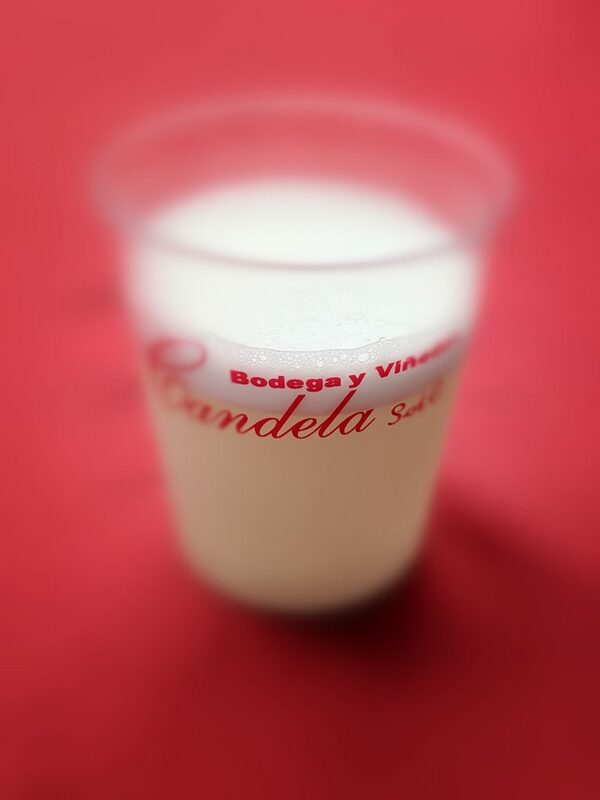 A tiny shotglass-sized sample of Candela’s house pisco sour cocktail. The pisa uva event brought a sizeable crowd, clearly all locals from “SJL”, and despite some pretty rough surroundings, was a well-put-together event. Traditional dancers from a local dance school entertained the crowd, who downed the free pisco sour samples, and then dined on a traditional Peruvian plate called carapulcra con sopa seca. 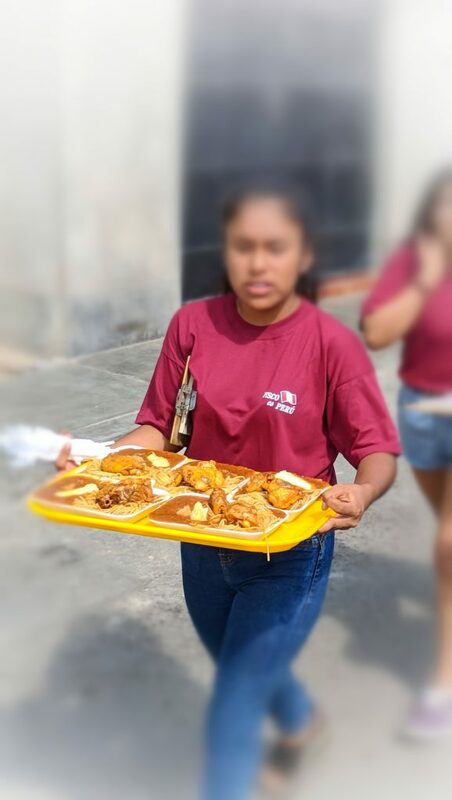 That dish is made from lentils, pork and mild spices, served with chicken, spaghetti and yucca. For me the dish fell flat — I’m not a fan of carapulcra — but that pisco sour was a hit! But something was off — we bought a bottle of what was supposed to be the same Pisco, and when we made our own sours at home, the Pisco was clearly not the same one offered at the event. Instead, we were hit with a rush of raisins, which is not what Pisco should taste like. This would make sense only later, so keep reading. Mischievous “devil dancers” performed a traditional dance I had never seen before. Server brings out a tray of carapulcra. Next, the organizer of the event – an archeologist from San Juan de Lurigancho who promotes such events — gave us a personal tour of the Candela winery. As I said, this is literally someone’s home, with the bottom floor converted into a makeshift wine bar, and some grapes stuck on the roof. People live on the middle floors. The terracing and wine placement is nothing scientific, total chaos necessitated by the lack of space. 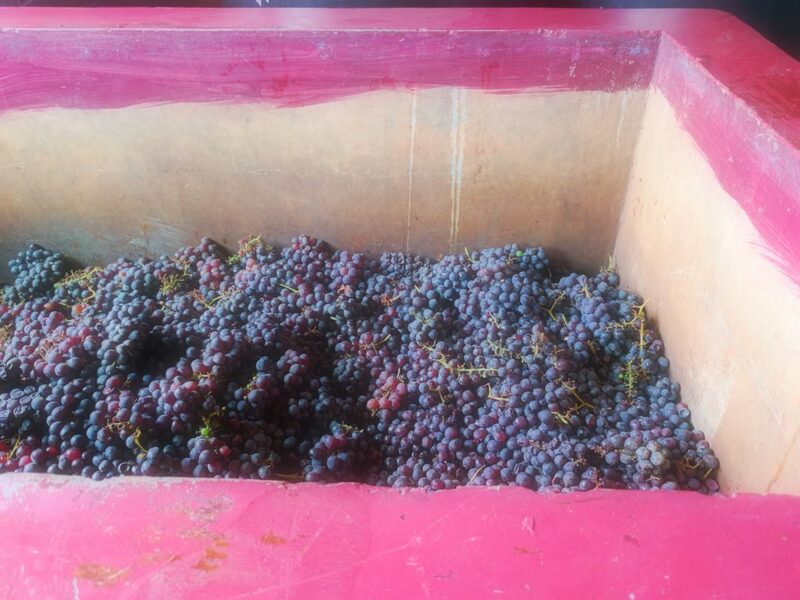 Both grapes — white and red — are strewn together, and despite the “harvest” having been completed — which must have taken a total of a few hours — there were still plenty of grapes on the vine. 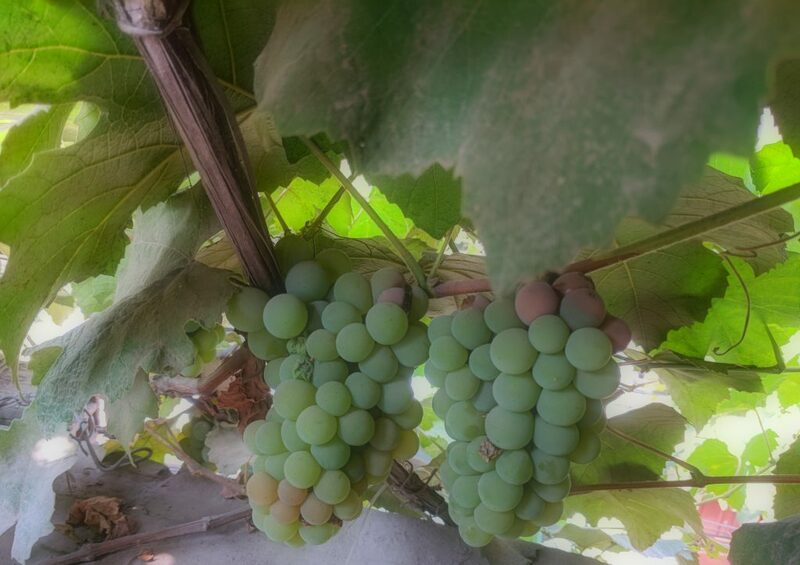 Some of the borgona blanco grapes showed significant rot and parasite attack, but the borgona negra appeared pretty healthy. Some of those, however, had an unspecified mold that I can bet my life wasn’t botrytis, since the region is hot and arid. Lord knows what it was. Borgoña negra on the vine. I also saw no barrels, nor any of the traditional Peruvian ceramic casks that are often used in this country. There was, however, a large array of polyethylene tanks, sold for residential water storage or cistern use. Hmmm. Now let’s go back to those grapes. Peruvians don’t know this, but you’re not really supposed to call it “wine” if you don’t use grapes from the vitis vinifera species. “Borgoña” is just another name for Concord grapes, or grapes from that family. They are meant to be eaten, not turned into wine. But the proliferation of Borgoña-based wines in Peru says a lot about the problems facing the country. 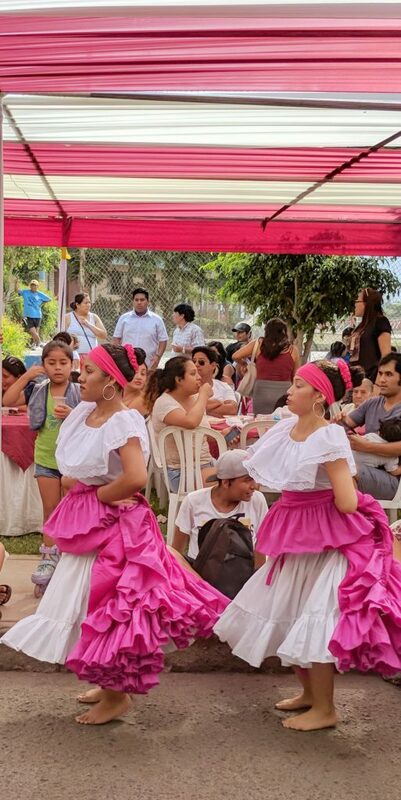 The main event was, of course, the pisa uva itself — three dancers climbed into a small concrete box which held the red grapes, and performed another afro-peruvian dance while traditional drummers pounded out an infectious beat. It was clear the girls hadn’t done this before, and it took them a few seconds to get their rhythm because, let’s face it, dancing on grapes isn’t like dancing on the floor. It was all ceremony and hype, though, since they didn’t actually finish the job. Since there was no other mastication equipment in view, likely one of the house’s residents would be finishing the mashing — by foot — over the next day or so. Borgoña negra grapes awaiting a good foot-stomping. The crowd went wild for this rare site, and the wine store was selling a good number of bottles. Most of these were being cracked open right at the tables of the event, and few were waiting to take them home. We were given tasting samples of the wines, and it was … well, not good. Peruvian wine is sweet. I mean, often, sickly sweet. One blogger wrote this off as part of the Peruvian sweet tooth, and while it’s true that Peruvians seem to amp up the sugar in their desserts, I’m not buying it. 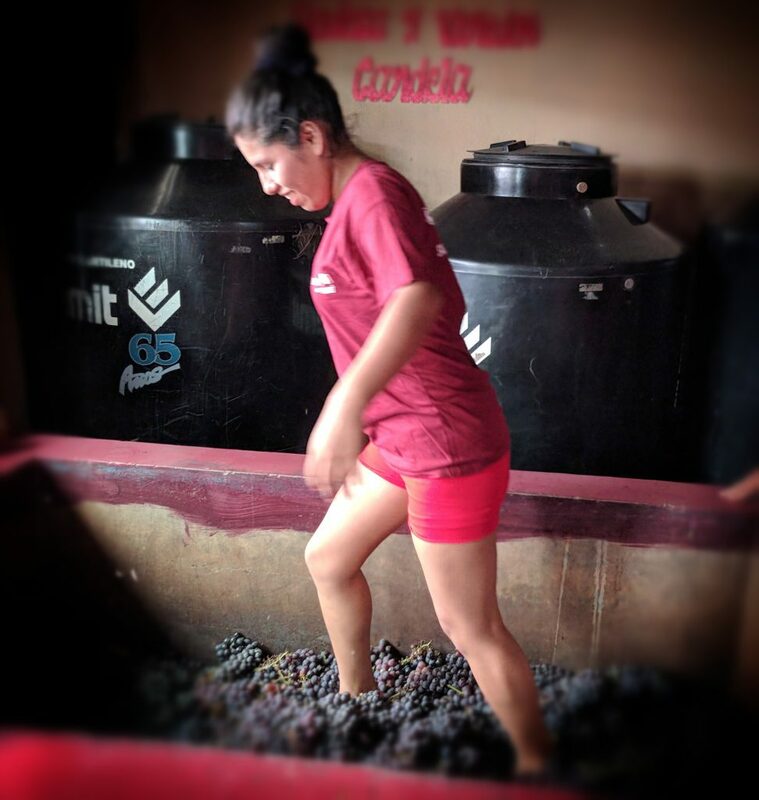 The sweetness of Peruvian wine is partly due to the grapes used — Borgoña is one of the only grapes that can grow here with any reliability — but then partly due to Peruvian obsession with making everything “on the cheap.” They can’t justify using a steel vat if they can buy a plastic cistern tank at the local hardware store for 1/100th of the cost. Without much decent land to grow grapes, entire generations have grown up thinking Borgoña is a wine grape, and the country drinks the most sickeningly sweet, raisin-flavored syrups imaginable. Here we got a lesson in this problem close up: Borgoña can grow on your roof, so if you have enough of it, you can open a “winery.” Peru has no regulations on what is put on the label. There’s also little sophistication in the winemaking processes used. The overall goal appears to be to process the wine as quickly as possible in order to get it to market. Local wines often go out with labels misspelled, bad corks, and highly inconsistent content. The result is sweet wine because they simply don’t bother to do anything else, and the Peruvian population has been calibrated to believe all wine is supposed to be sweet. 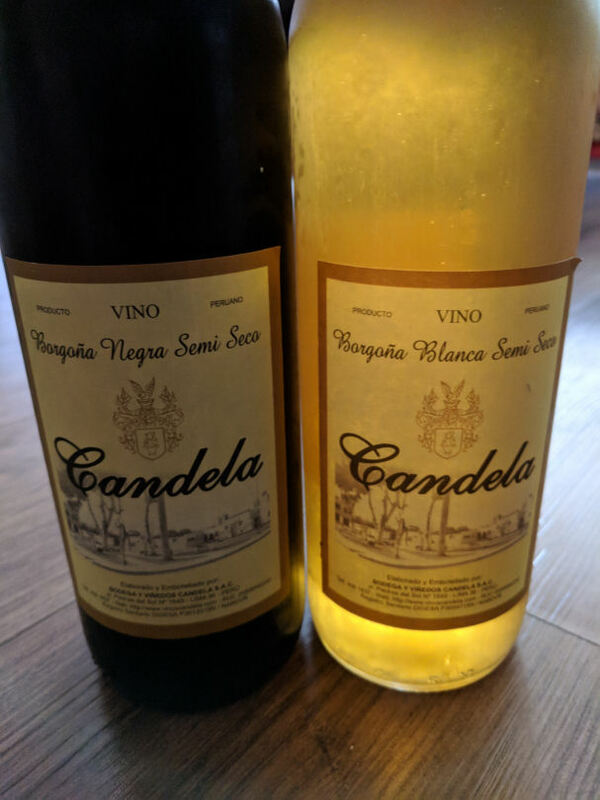 The two Candela offerings, both marked “semi-seco,” were in fact on par with the sugar level of a Niagara icewine. When a Peruvian offers you a “dry” wine, it just means it has less sugar than a stack of syrup-soaked pancakes, but not as much as if you threw a bag of sugar on top of them. The main national producer here is Santiago Queirolo, and they pump out hundreds of thousands of syrupy garbage as fast as they can make the stuff. It’s priced at Thunderbird levels, so winds up on everyone’s table because Peru has not yet learned to go beyond its Third World culture when selecting wine. There’s little excuse for it, too, since Chile and Argentina have economies similar to Peru, and yet they take pride in their wine. 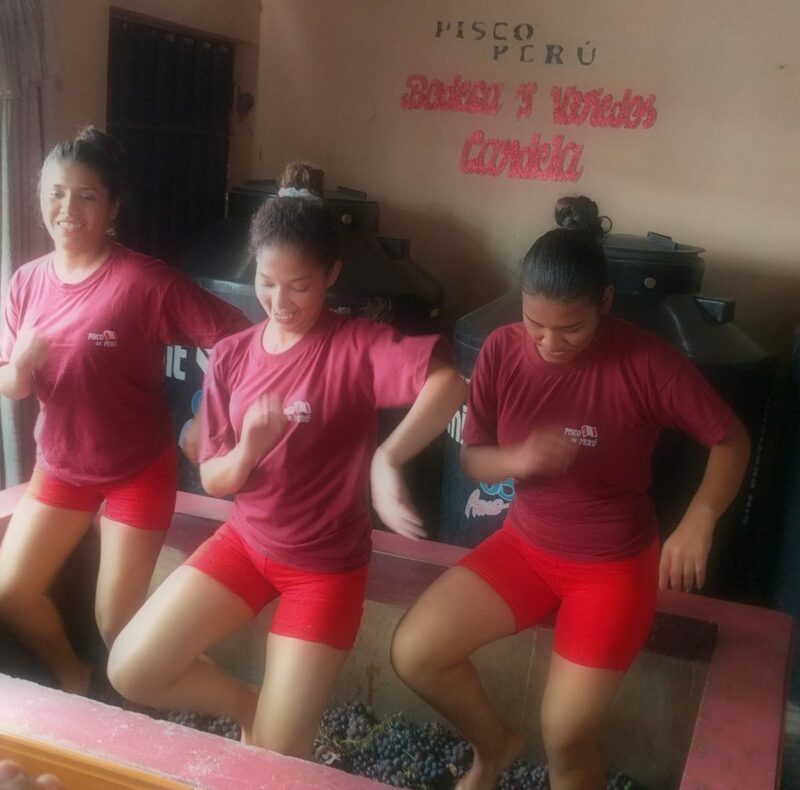 Peruvians have no such pride in wine, and don’t even know they should. So the Candela offerings were approached with the usual mental adjustments. They still failed to live up to expectations. First up was the Candela Borgoña Negra Semi Seco NV, and yes, it tasted like raisins. There’s just no getting around that when you use grapes intended for eating to make table wine. As for the “semi seco” part, it’s just not true. This is sweet as hell, and I would put this at 100 g/l RS at least. I’m not kidding, this is what they think is semi-dry. The wine itself had both a bitter foretaste and aftertaste, and there was no structure to speak of. There were no perceptible tannins at all. The white variant, Candela Borgoña Blanca Semi Seco NV, didn’t fair any better. It was slightly less raisiny, but only by a bit. Again, the raisin notes overpowered anything else, and given the terroir — someone’s roof — there are no other ways to introduce any additional nuances. I’d put this at less sugar, probably 65-80 g/l RS. Still sweet. So, yes, both wines landed a single star, alas. But the event itself was fun, filled with lively people and amazing music, and the food was good. The people were very proud of their wine, without a clue about how bad it was, so I won’t try to convince them otherwise. But, wow, that was one batshit crazy winery visit.